Need a global API airport code data feed for your website? We provide an easy to use API with access to information on thousands of airports around the world. We make it easy for you to add an airport code autocomplete field to your travel website. 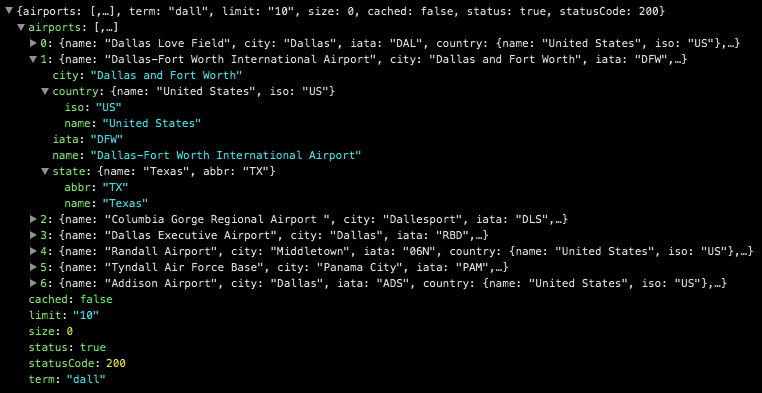 We make accessing the Air-Port-Codes data a breeze with a simple json response. Simply parse the response in whatever language you prefer. Every airport has an associated Longitude and Latitude value allowing for easy integration into Google Maps or other mapping services. Some airport codes handle multiple airports within a city. Our autocomplete endpoint will nest those so your UI selections can be better organized. Results are sorted based on several criteria including airport size, servicing area and even location of matched search term. Our airport codes database is growing regularly and being refined daily. We welcome your input and verify every entry for accuracy and integrity. We don't like to wait and we don't think you should either. We are continually working with our hardware and software to ensure you get your results fast. Ready to access our airport codes? Our API offers many options for a variety of different feeds. Have a look at our API Docs. If you need a custom feed, let us help you. We can probably build an endpoint for you to access what you need. Our database is large but it didn’t get like that on its own. If you want to suggest a new airport, you can. If you want to update an existing airport, you can. All additions are verified by us to maintain the integrity of the data.